The weather is finally starting to warm up, and so is the housing market in Central Iowa! After a long winter, green grass and colorful flowers have started popping up - and so have more and more “For Sale” signs. Following a projected dip in March, housing inventory has started to make its way back up and is anticipated to increase as the temperature does. With more homes being listed, make your house stand out this season with these 10 tips to sell your home in the spring! When selling your home in spring, it is critical that your yard and landscaping are in prime condition. Buyers formulate a lasting first impression of houses within the first 60 seconds. That amount of time does not even give them a chance to enter your home, so make your first impression count! Take it beyond landscaping - think about the physical exterior of your house as well. Simple tasks such as power washing the siding, repainting the front door or even adding a new welcome mat can freshen up the outside of your home and make it more welcoming for potential buyers. If you keep all of your clothes in your closet year round, put away your winter clothes for showing. Sweaters, coats and bulky winter clothes take up more space in closets that, in turn, make them look smaller than they are. Don’t go overboard and take all your clothes out though. Buyers want to see the “fantasy” version of your home, so have the spring wardrobe present in the closet to add consistency to the appearance of your home. Spring is one of the best times to list your home. This means buyers have other options. You want to avoid overpricing your home and scaring away potential customers. Many buyers will not even tour a home that is substantially out of their price range, so don’t eliminate your home from their list of choices. Your Realtor can help assess the market value of homes similar to yours in the neighborhood and set the optimal price for your listing. Bring fresh air into your home to drastically change the mood and feel of the room. If the weather is nice, open the windows and let the natural light brighten the room. Concerned about rain? You can still open the blinds and turn all the lights on to brighten up your space. After you open the blinds, make sure your windowsills, which often get neglected, are sufficiently dusted. Even if you have dusted every square inch of your home, when you open the blinds, things like spider webs that were not previously noticeable become easily seen. Walk through your home with the lighting set the way you intend it to be for a showing. This gives you the opportunity to see your home from the angle potential buyers would, and allow you to spot those elusive spider webs. Your family has spent most of the winter cooped up indoors, which allows extra dirt and particles to accumulate deep within the fibers of your carpet. If you have already done your spring cleaning, there is a chance additional dust has also reached your carpet as it was removed from other surfaces within your home. Deep clean your carpets to remove any subtle odors and refresh a room. Consider swapping out dark accent pillows and rugs for vibrant spring-colored accents. Since colors dramatically dictate the feel of a room, bright colors add warmth and comfort to your home and help others envision themselves living there. This can also be incorporated into other rooms of the home. In the bathroom consider using seasonally colored towels. In the kitchen, place a bowl of seasonal fruit on the counter instead of the bowl with keys! In the movies, they joke about the smell of fresh baked cookies being welcoming, but there is something to be said about appealing to multiple senses. Invigorating spring scents can easily be incorporated through candles, air fresheners or diffusers. To subtly bring in these scents add fresh flowers in various rooms of your home, as they can double up as seasonal decor. Consider filling the sink with ice and water bottles for guests during an open house if it is a hot day. Then they will be focused on the perks and selling points of your home rather than how thirsty they are. If you feel ambitious, you can print out labels with a photo of your house and the URL of your listing so when they leave, your home will still be at the front of their minds. Don’t forget to wash all windows and mirrors. 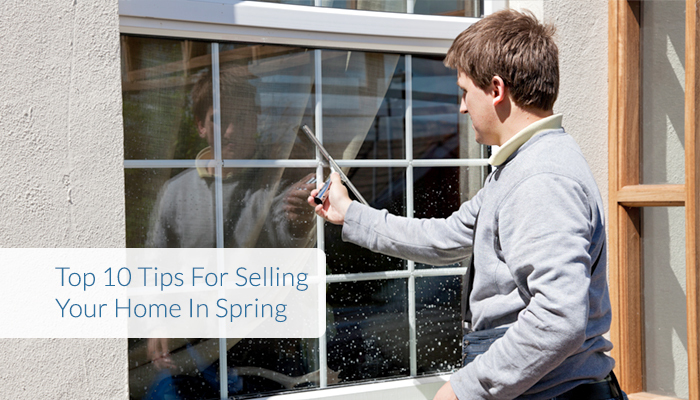 These are often overlooked, but every window, including the ones on the front door, should be washed before a showing. This is a free way to add sparkle and shine to your home, which are qualities you should value when preparing your home for sale. Clean windows and sunlight that bounces off your mirrors will make your residence more inviting and welcoming. Most potential home buyers know they are buying more than a house - they are buying a home, the neighborhood, the nearby amenities and the community as well. You know your home and the area better than anyone else, so fill potential buyers in on the things you love most! Write a “love letter” to potential buyers that shares the perks of your home, such as nearby parks, schools and local businesses. Additionally, include a history of upgrades to the home, tips on how to maintain the landscaping, and details on which neighbor makes the best cookies and who would be willing to watch the family dog when they are on vacation. Did you know that over the last 30 days (3/14/15-4/13/15) in the Des Moines metro, there have been 1,066 accepted offers on single family homes and the average days on market was only 66. Don’t let another year go by - take advantage of the beautiful spring weather and great housing market in Des Moines. Connect with Space Simply online or call us today at (515)423-0899 to get your house on the market!